Leftwich? Batch? The Steelers solved their backup QB conundrum this week with an answer that may surprise you. 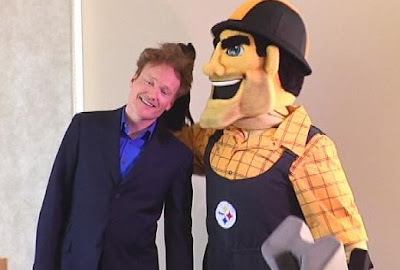 Introducing #11, Conan O'Brien. He immediately takes over Jeff Reed's title of best hair on the team. 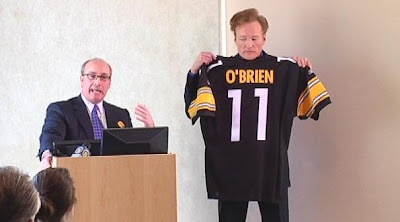 O'Brien was actually in town to visit WPXI, and at a reception Pittsburgh city councilman Doug Shields presented O'Brien a proclamation, declaring June 1 Conan O'Brien Day in Pittsburgh. June 1 would be the day that O'Brien will be taking over the Tonight Show from Jay Leno, and apparently Pittsburgh is excited about it. 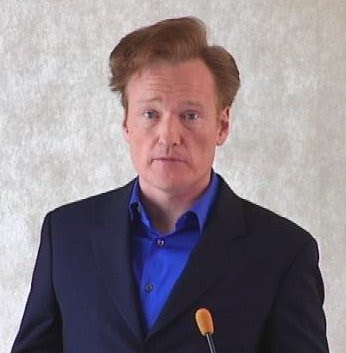 Pic #1: Conan's hair looks like its taking on a life of its own. Pic #2: Why does Conan look like he's being held here at gunpoint? Pic #3: "Nobody said anything about making nice with a gay steelworker." SantoGold, Conan's grimace is shades of Favre's introductory press-conference at the Meadowlands. But in the Cone-bone's defence, it's hard being a Patriots rooter in Stiller country. In fact, I'm surprised somebody wasn't murdered.